Nothing eventful happened until lunch today. All four of us students won medals at the awards ceremony, but to be honest I really wasn’t that into it (sorry, am I allowed to say this?) Lunch was nice; I had some watermelon, but for some reason I didn’t have much of an appetite. It hit me that the next day, all of the students who had come to Beijing for this competition would disperse and head each our own separate ways. There were so many new friendships I was just forming or hadn’t even begun to form yet. In the afternoon, we went to the Mutianyu section of the Great Wall. 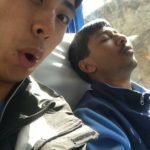 Arjun fell asleep on the bus. We four students and Matt decided to form a group together. At first, it seemed hiking the Great Wall was a Great Cakewalk, but we eventually reached an extremely steep section. From the base of the mountain, it looked like that section had a grade of 40-45 degrees. Nevertheless, we all made it up! We stopped at the next turret and soon, it began to snow! Ana Sofia and I also had the opportunity to take some very candid Prom pictures.